Please be aware that there will be update in the CAC UDRP fees applicable from February 1, 2018 (i.e. on complaints that will be delivered to the CAC on or after February 1, 2018). Structure of the split fee will remain and the initial fee will increase in most of the cases and the additional fee will decrease. This fee schedule reflects more the actual costs and time spent on the proceedings. Please see the new fees schedule for more details. The Czech Arbitration Court ("CAC") is organising a Panelists meeting for .EU (and .EЮ), UDRP and .CZ Panelists and Experts. The meeting will take place at the Kaiserstein Palace, Prague, on 18 September 2017, however there will be also informal part of the meeting on 17 September 2017. Please find enclosed the programme for more information. The CAC looks forward to meet again with its Panelists and Experts in Prague and looks forward to interesting presentations and discussions on current issues related to domain name disputes. As of 26 February 2013 the Czech Arbitration Court operates as a .sx domain name dispute resolution provider appointed by SX Resgitry SA, the .SX registry. The .sx disputes are conducted under UDRP Policy and Rules. These disputes are decided by UDRP Panellists. As of 1 November 2011, the Czech Arbitration Court will cancel the possibility of filing UDRP complaints and responses using the Chess Cards. Those who were issued a Chess Card will no longer be able to use it to make a UDRP filing with the Czech Arbitration Court, however their user accounts created by registration made on the online platform will not be affected by the change and they will be able to continue to make their UDRP filings without using the Chess Cards. In the autumn of 2009 we published for public consultation (http://adr.eu/arbitration_platform/public_consultations.php) our proposal for the Expedited Decision which has been the subject of much discussion amongst the Internet Community. One of the criticisms of that proposal is that it introduces a dual-track UDRP that is not permitted under the Policy and Rules. We do not agree with this criticism but this is not the key aspect of the proposal. The core of our proposal is the introduction of a substantially lower filing fee for simple cases where no response is filed and there is no need for Panellists to produce a detailed decision. ADR.EU has therefore decided to remodel our proposal to concentrate on this core idea. We attach a changed Fee Schedule which will become effective as of 15 March 2010. There will be no check-box decisions and the same decision form will apply for all the decisions – see attached. We anticipate that UDRP decisions in simple cases where no response is filed will be quite short and will just outline reasons for the decision. Model forms of decisions in simple cases and in other than simple cases will be put prominently on our on-line platform as guidelines for our Panellists. Panellists will also retain an absolute discretion even in cases where no response has been filed to notify ADR.EU that the proceedings are such that a more detailed decision is required and to require payment of the additional UDRP fee (see the attached proposed new Fee Schedule) in view of - inter alia - the complexity of the legal arguments, the length of the complaint or the amounts of exhibits to review. As a separate exercise we will also modify, as of 15 March 2010, certain parts of our standard complaint and response forms which appear on our on-line platform – see also attached documents. Our aim is to make it easier for complainants and/or respondents to file their submissions on our UDRP on-line platform. These forms will be complemented by additional explanatory notes on the on-line platform. As we have announced earlier, as of Monday 1 March 2010 we will implement the e-UDRP. Parties filing their Complaints or Responses will no longer be obliged to submit a hardcopy of their filing or use a Chess Card. However, using the Chess Card remains available to those who wish to have their electronic filings authenticated in a similar way as handwritten signature authenticates hardcopy documents. These changes do not require any modification of our UDRP Supplemental Rules. In addition, the CAC has implemented a new feature of the online platform that will facilitate filing a Complaint – a Registrar database. From now on the Complainant does not have to search for the identification of the Registrar to be able to file a Complaint properly. It will be able to choose a name of the Registrar from the drop down menu instead and the other contact details will be prefilled automatically (postal and e-mail address, phone number, etc.). 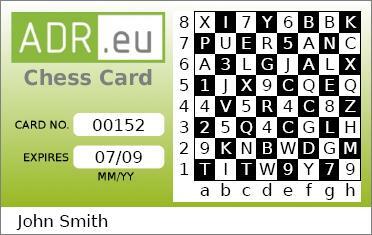 As of 1 March 2010, the ADR.EU Center of the Czech Arbitration Court will not require the use of Chess Cards for electronic only UDRP filings. Parties to a UDRP dispute will continue to be able (but not obliged) to use their Chess Cards for increased authentication of their electronic filings. ADR.EU will still require as a minimum on-line security tool that the parties of a UDRP proceeding register themselves on the UDRP on-line platform (udrp.adr.eu) and receive their unique username and password. This relaxation of conditions for electronic-only UDRP filings follows recent decision of ICANN Board to amend the UDRP Rules and enable electronic-only UDRP (see the ICANN announcement). The Czech Arbitration Court has decided to lower its fees for .eu domain-name disputes so that the fees for both its ADR and UDRP procedure were the same. Please click here to see the details. As of 6 May 2009 the Czech Arbitration Court operates as a .co.nl domain name dispute resolution provider appointed by EuroDNS S.A., the CO.NL Operator. The .co.nl disputes are conducted under UDRP Policy and Rules. These disputes are decided by UDRP Panellists. Our Pilot project related to new electronic UDRP services has ended and the piloted electronic services are temporarily suspended pending the resolution of ICANN Board on the Pilot. We hope that ICANN Board will consider our Pilot soon.In the meantime you can still file your UDRP Complaints/Responses in a standard way (in hardcopy and in electronic form). The Czech Arbitration Court (CAC) is launching its Uniform Dispute Resolution Policy (UDRP) service on 12 January 2009 by running two initiatives designed to streamline the process and to save complainants and respondents both time and money. The CAC’s UDRP Service is available at udrp.adr.eu . In January 2008 ICANN, the Internet Corporation for Assigned Names & Numbers, approved the CAC application to become an international provider of UDRP services. CAC has then undertaken a 10 month consultation of intellectual property owners and the legal representatives of both complainants and respondents. The UDRP features an expedited procedure that is mandatory upon all registrants of generic Top Level Domains including .com, .org, .net, .biz, .info and .mobi. It is designed to settle disputes arising from the abusive registration of domain names. After the tests, a formal Pilot Programme, open to all interested parties who can file complaints using Partial or full e-filing will run from January – March 2009. The results of the Pilot will be presented to ICANN for consideration. Zbynek Loebl, head of the UDRP Implementation Team for the CAC which is a non-profit organisation based in Prague, said, “Our aim is to lessen the burden on both complainants and respondents by utilising the functionality of the internet. The preparation of a UDRP complaint or response is cumbersome and time-consuming. Currently at least four copies must be prepared and sent out by registered courier. We believe that e-filing will reduce the administrative burden and cut costs without compromising security. We are grateful to ICANN for being open to our aim and we are pleased that other UDRP providers are considering the benefits of e-filing”. An additional innovative feature of the CAC’s UDRP service is the option for Class Complaints with the filing of a single complaint on behalf of multiple complainants. Vit Horacek, CAC’s Board member responsible for the UDRP implementation said, “We believe that the option of a Class Complaint could be very attractive to trade mark owners who wish to tackle serial cybersquatters who focus on a business sector”. The CAC is glad to announce that persons who file the first three UDRP complaints on the CAC’s on-line platform (starting on 12 January 2009 at udrp.adr.eu) will be awarded electronic-only gold, silver and bronze medals respectively, accompanied by small hard-copy gifts. About the Czech Arbitration Court: The CAC is a non-profit organisation based in Prague, attached to the Economic Chamber of the Czech Republic and Agricultural Chamber of the Czech Republic. Established in 1949, CAC manages domestic and international commercial disputes related to IP and technology matters. In 2007, CAC administered over 2,000 arbitration proceedings. Since 2005, the CAC has administered almost 1,000 .eu ADR cases for EURid, the registry operator for .eu and the European Commission. Proceedings are managed in 21 of the 23 official EU languages (the exception being Irish and Maltese) using an innovative on-line platform. About the Electronic filing of documents supported by hard-copy signature: A filing Party – either a Complainant or Respondent - who has filed a submission using CAC’s on-line platform, will be sent a hard-copy Signature Page listing all their documents. The Filing Party confirms on this Signature Page that documents locked in the on-line case file are correct then prints the number of copies of the Signature Page prescribed by the UDRP Rules, signs and returns it to CAC‘s Service Center. Finally, the Service Center prints the whole submission and delivers it to the CAC. About Electronic UDRP: Complainants and Respondents can submit filings using a simple and secure electronic platform without the use of paper. In order to verify the authenticity of documents, users will be issued with a unique CHESS CARD. the person representing the different Complainants joined in the Class Complaint must provide evidence that it he is authorised to act on behalf of each of the Complainants. We are delighted to present you an easy and flexible possibility how to familiarize yourself with our new UDRP on-line platform. You can access our Test Platform which is available on: http://udrp.expert4me.com/. All you need to do is to click onto the on-line platform in the main menu, register your name and details and then follow the instructions. If you have any technical difficulties, please contact the UDRP Support Team who you can reach by e-mailing support@expert4me.com. The Log-in information you receive for the Test Platform will not work on the Live Platform. The Test Platform is not protected by a digital certificate issued by a recognized international certification service provider. The Live Platform has received a digital certificate from Verisign. We do not want you to use data from live UDRP cases on the Test Platform. Data from old cases with the names changed or dummy cases is all that you need. You can request the Chess Card which will enable you to test full eFiling on the Test Platform. However, for the purposes of your testing, you will only be sent a soft copy. (On the Live Platform, participants willl be sent a hard copy of the Chess Card). Do not test the option to pay by a credit card, you would need real data and this is outside the scope of your review. This payment option has been implemented though and the users will be able to use it in the Live Platform. Everything that you submit on the Test Platform will be treated as Test Data. The Platform will not generate emails to third parties, ICANN or registrars although for the sake of your testing, it will appear as if such emails have been sent and confirmations received. There will be no administrator to administer your test cases, no decisions will be issued n the Test Platform etc. The Test Platform serves only for you to get used to the on-line platform before you start using the Live Platform. In addition to your testing our Test Platform you can participate in one of our training webinars – please click on the section Webinars in the left-hand menu to know when will the webinars be organized and how to register for them.